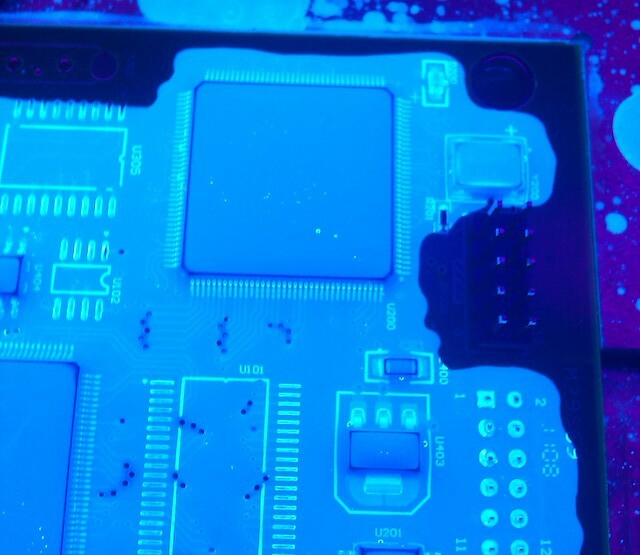 Selective application of conformal coating is this case is applying the conformal coating without using masking to shield components from ingress. Technically using masking tapes, latex and boots is a selective process. But, we want to look at coating application without masking. This leaves a couple of different options. The first is brushing. This is a simple selective process that can be highly effective. The second, and the more obvious option, is selective robot. This process uses a small spray valve (there are many conformal coating spray valve types) that is attached to a robot that follows a set pattern applying the conformal coating selectively to the circuit board.